Discussion in 'Music Corner' started by George P, Mar 8, 2014. This thread (and the 53 that have preceded it) is for all things that relate to Classical Music. Feel free to post what you're listening to, recordings you recommend, recent classical purchases, classical concerts, classical works, classical composers or classical performers. EDIT: Sorry, I missed the embedded link. Not the complete set of five volumes mind you. I have Vol 1 and Vol 2. Wonderful music as long as you don't require banging and pounding from piano works. 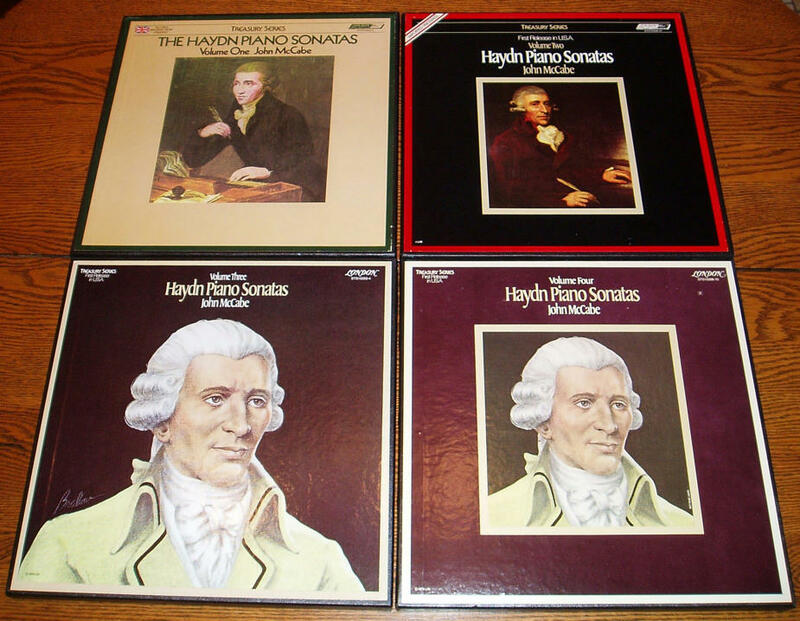 Astonishing how Haydn could churn out 18 LPs worth of piano sonatas that are endlessly inventive. McCabe plays them perfectly and the Decca sonics are very good. The only nit is a small band of glassiness in the lower treble. Robin L and dale 88 like this. The same could be said of his symphonies and quartets. Haydn, while hardly "obscure," really doesn't get the kind of attention he deserves. I've been dubbing some 78 sets today, and I was wondering what to do next. Thanks for bringing Haydn up; I think I'll get out the Koussevitzky recording of Sym. 102. I see you must have the British issue? I have 4 volumes of the set when it was issued here on the London Treasury Series label. I will have to compare McCabe against a current favorite of mine - Bavouzet on Chandos. Mr Bass and EasterEverywhere like this. The point about the piano sonatas is that unlike the quartets and symphonies they don't have the possibilities in instrumental variety. In addition, the style is restrained dynamically (and dramatically). He is basing interest on pure musical content rather like Bach. Part of the problem is that his music is generally poorly performed IMO and rarely given sonically excellent recordings either. The Dorati cycle was a grave disappointment at least to me on both counts. But I agree with your basic premise. Paid one of my rare visits to Dale Music (a celebrated, at least locally, sheet music store in downtown Silver Spring, Maryland) yesterday and heard some sad news: a developer has bought the entire block where Dale is located and plans to tear everything down to build condos. Dale has been in that location for something like 60 years. The owner is now in her 70s and understandably does not plan to start over in another location. Referencing an earlier post I think this is a national trend. Musical instrument and music scores stores are closing in many places. I assume schools purchase from institutional wholesalers. Is everyone else buying them on Ebay or has the downturn in the music business just depressed the overall market to depression levels? I don't think the issue is real estate development per se. If it was a thriving business someone would rush to buy it from her and relocate. I'm guessing a big culprit is Internet sales--why trudge to a physical store when you can order the music for delivery right to your door or even to your computer printer? Another is probably the decline in musical amateurism, leaving a smaller market for sheet music in general. Whatever, it's a real shame to lose places like Dale. They offer an institutional expertise that will not be replaced by newer distribution channels. There isn't any decline in musical amateurism that I can see although perhaps you meant amateur musicians. You have a point that music scores and non institution instrument sales are tied together. Saw Alexandre Tharaud last night with the Pacific Symphony Orchestra. Ravel piano Concerto. Like a number of others here, the two I missed were the Debussy and the Britten. As for Britten - the pieces I enjoted were the cello suites and a disc including the Serenade for Tenor . . ., Nocturne and Les Illuminations. Don't forget the piano trios. If you are looking for classical sheet music in NYC, there are really only two stores, Julliard and Frank Music. And the Baryton trios!. I love the McCabe set, but have gone down the route of having lots of different performers for my quartets lps. As one of the great books on the quartets states, there are about 45 truly great quartets, starting with Op9 no4, followed by one or two of Op17, and all seven further groups of six, plus one or two singles and pairs that follow. I even like the mix of having romantic era instruments and correct era instruments. Lots of lovely mono era accounts I play with mono carts through a valve phono stage. Haydn is definitely the greatest single quartet writer for me. That really says it all. If there are only 2 stores left standing in NYC the ballgame is over for retail sales. Landmarks of 20th Century Music:Berg, Schoenberg, Webern. Prausnitz, Bertini, Heather Harper. EMI UK. This was an excellent compilation of the Second Vienna School with fine sonics. A few of the works are serial, but the majority are either tonal or "free" atonal. The works chosen show the continuity of late Romanticism with the music of these 3 composers. Also the two serial works, Schoenberg's Six Pieces for Male Chorus and Webern's Cantata 1, are both vocally oriented which works much better with serialism IMO. I do not enjoy purely instrumental serial works but the Cantata is very lyrical in a spooky kind of way and the Six Pieces are actually quite humorous. I never realized Schoenberg had any sense of humor. Heather Harper sings the soprano parts in the Webern and Berg works. SquaRoots and Robin L like this. Luckily, the used CD market is still doing Ok. I find buying used stuff a lot more fun. You mean the used CD market is doing OK for the buyers, not the stores/sellers. It's quite possible the next 5 years will produce an enormous glut of used CDs similar to what happened to vinyl in the late 80s. 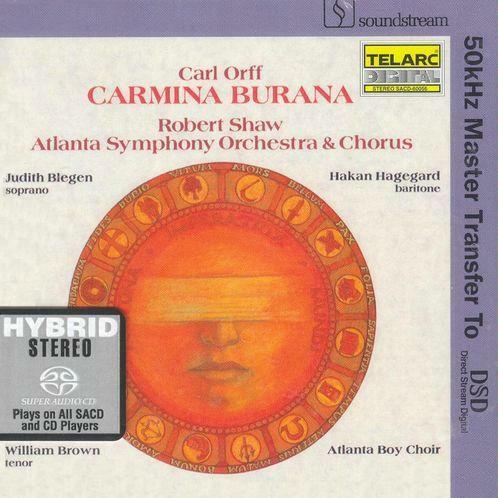 Now listening to the Shaw version of Carmina Burana on...SACD! Was able to track down a like-new copy for €10 shipped. Huge sound; and another nice bonus is that all 25 tracks are now indexed. The previous CD version displayed 4 tracks only. Rose River Bear and Stone Turntable like this. There are no music shops of any kind left here in the hinterland. Our last used store, CD Warehouse, closed about 7 years ago. Just noticed a forthcoming Colin Davis boxed set with 8 SACDs, 4 CDs and a DVD, some previously unreleased. The price is very attractive, so I've preordered, but I've never bothered with the LSO SACDs previously, or heard anything to their credit. Anyone care to clue me in? Cheaper in the UK by the look of it (at the moment). It's a lot of music for the money, although the SACDS seem to be readily available individually. I think CDs are included because Les Troyens is a major recording and as far as I know has never been remastered for SACD. In the Philly suburbs, there was a big used CD/record shop Plastic Fantastic that closed up about 10 years ago because of the falling CD sales even then. The owners came back with a smaller vinyl only store 5 years ago ironically enough.